Looking for some feed back. Okay guys I added another pipe accessories set to the things I am making. The problem is I am not sure what to charge for them. It anyone would give me an iidea what you might pay for them it would be a huge help. Thanks. A suede pipe rest and pipe cleaner sock that sticks to the ceiling? Well, I'd charge double for that, maybe even triple! Do you use velcro to stick it there or what? Actually it is kind of an oiled type finish with a suade back and is plyable enough to fold making returning extra tobacco to your jar easer and almost mess free. I thought the cleaner sleeve and stand would make it a nice set. After some research and thought I feel I can offer them at $20.00 a set plus $8.00 shipping within the US. this will cover my time and materieals nicely and still offer those who choose to buy them a good value for their money. Oh and sorry about the upside down photo. my phone kept flipping it for some reason . I cant figure out how to get it turned right side up. All I can offer is that $20 + $8 shipping is a bargain at twice the price. Yo should do well on this Eric. And do post this in the commercial forum. I plan on it once I figure out three more things how 1) how to use my paypal to recive payments. 2) How to turn the picture rightside up an3) how many I have left after a trip to one of the local B&M's that buys from me. The simple leather pipe accessory market is small and fairly crowed. 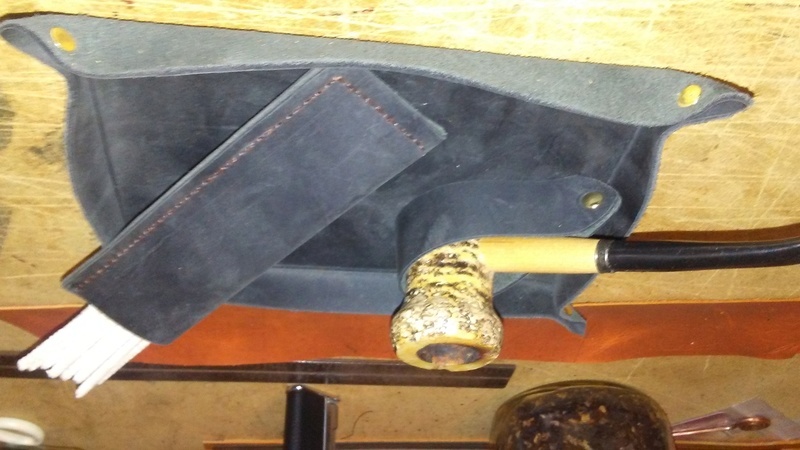 I have a friend who makes leather pipe accessories to sell at shows from his son's table. He does it more for fun and the only way he might make a little money is because he gets high quality leather scrapes free from a friend. I'm fairly well accessorized but it's a small would and I found a simple leather pipe rest that was made by an other leather work friend who made them as gifts for table holders at a MAPS pipe show probably 10/15 years ago in the hallway of the smoking floor of the Palace Station during the WCPS last Nov. I am fairly well accessorized but there is a guy on the Reddit pipe group who was selling custom tobacco mats. I sent the artwork and had the mat (large coaster) in a week so you never know what will tickle someone's fancy. Stamp 'em with the Dunhill logo and sell for five times your current price. LoL! I have a Trumi travel change valet with the snaps like the one shown above and that probably was $100 something 2O years ago. You could be onto something here Richard, only with some form of personalisation such as initials, a name or phrase. That might the product more desirable Eric... a personalised set? Just my shilling's worth. That generated an idea...stamp the initials of any future customers. Michael's sells a complete set of steel alphabet stamps. You offer customized lettering " they will come "! If I made them from tooling leather. Have the tools to do that with but I would have to invest in different leather then I have at the moment. I am not opposed to the idea. I would how ever prefer to recoup the investment in the leathers I already have. What about adding in a corn cob pipe and cleaners to make it a full set? Its always fun getting a complete set of something. Make it a clean 30 bucks and there you go.